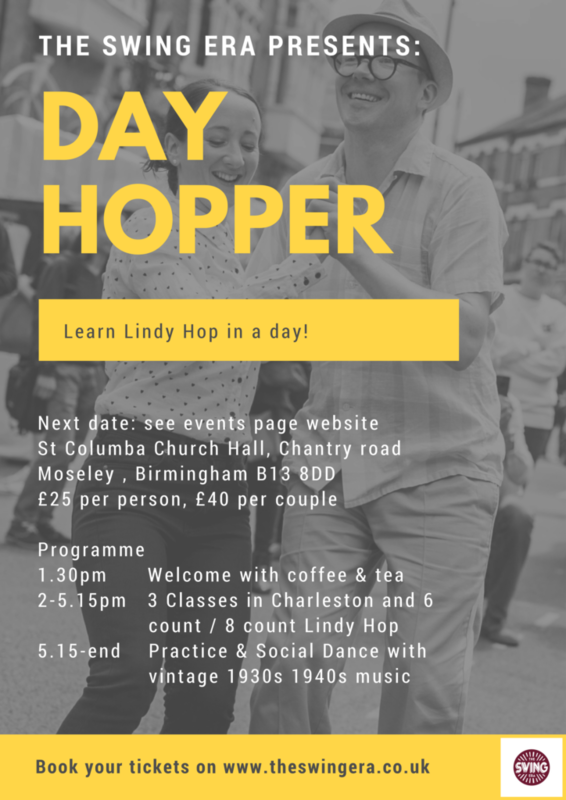 The Swing Era presents… Day Hopper – Learn Lindy Hop in a Day! Always fancied trying Lindy Hop, but never had the time to go to any weekly classes? Really want to get stuck in and get a good sense of what swing dancing is all about? Sign up to our Day Hopper! Whether you want to come by yourself (as a follow or leader, non gender specific) or sign up as a balanced Lead/Follow couple with your friend or partner, you are welcome to attend. This day workshop is ideal for people who have never danced before or have never danced swing dancing before, butis also suitable for Level 1 students who feel like they want to progress faster. 1.30pm Welcome with Coffee and tea. A chance to unwind and meet your teachers and the other students of the day. 5.15-5.30pm Practice session and social dance with vintage 1930s 1940s music. Prices are £25 per person or £40 for a couple. Gift vouchers are also available for single or couple tickets. The Swing Era is based in Moseley. We will run the Dayhopper classes in the heart of Moseley Village in the beautiful St Columba Church Hall in the heart of this bohemian neighbourhood, with plenty of coffeeshops, lunchrooms and cafes nearby.